This post is SWAK to the cute, tall PR dude at Carlos Miele yesterday who let me run into standing room last minute. Another Brazilian musician starred. I love the Miele shows. Click to get closer to those great booties. And I love yellow and black in check. Deep purple fur, coming and going. I fell for this little dress, hard. Coming and going again, pleated chiffon dress w/embroidered sash. Both views are fabulous. Beautiful show, love the purple and fur combo, so rich! Thanks for the scoop, as always. That little purple dress is adorable. Purple is gorgeous and well done you racing in at the back!! 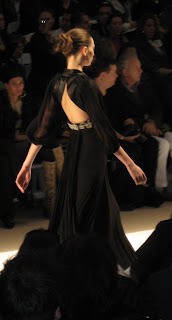 That black gown (the backless one) looks stunning, he sure knows how to drape fabric! Just lush and posh! Liking that purple dress with the shoulder action! Purple fur!!! Why don't you just kill me! I need it. I like this collection...the colors are great!